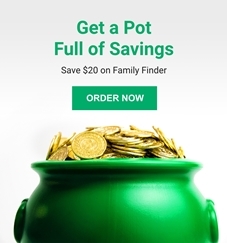 Family Tree DNA has a St Patrick's Day offer on its autosomal 'Family Finder' test. The US$20 discount brings the price down from US$79 to US$59 (excluding p&p). There are even bigger savings of between $48 and $73 to be had on Y-DNA & mtDNA Bundles. Discounts will expire at 11:59 pm PST on Sunday 18 March.